One of the more ominous statistics coming from this recession is that student loan debt has now surpassed total credit card debt in the United States. The reason for this is based on the deep impact of the recession. Credit card debt peak at $975 billion back in September of 2008 and is now down to $826 billion. This is good news right? Well the main reason for the decline has been through the rise of bankruptcies. 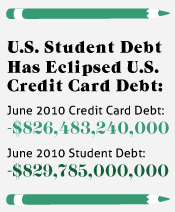 As this number decreased student loan debt has continued to soar and is now larger than total credit card debt. Part of it has to do with the fact that you are not allowed to discharge student loan debt through bankruptcy. 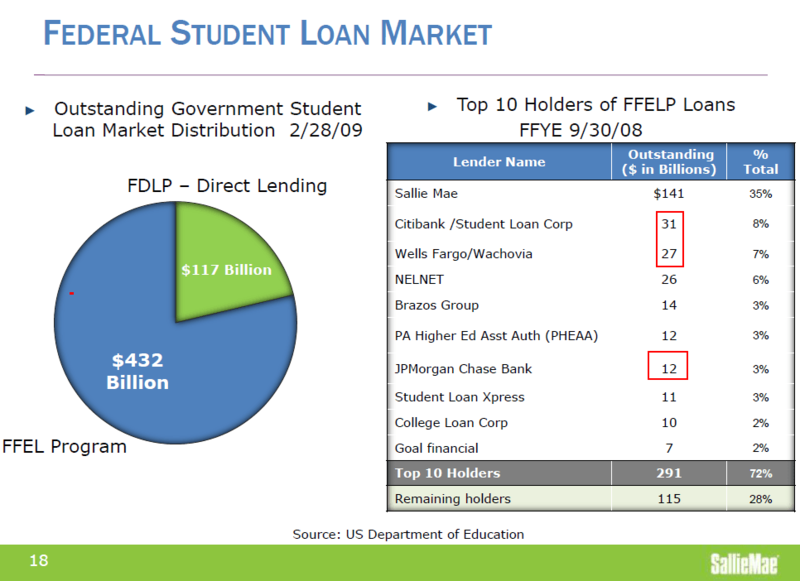 The government is the biggest player in the student loan market but the banks are the folks dishing out the loans. Similar to the housing bubble, when banks and government combine you usually end up with inflated prices and very wealthy bankers. The working and middle class end up paying for the bad bets in the end with inflated prices and giant amounts of debt. Past and current students carry a stunning $829 billion in student loan debt. 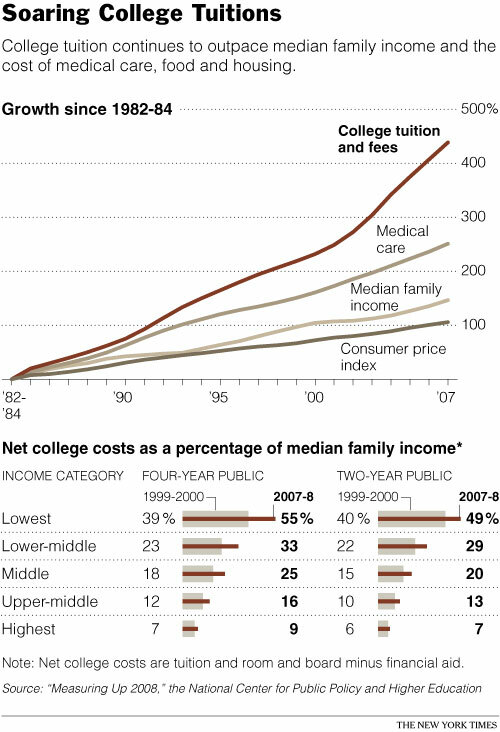 The cost of a college education has far outpaced the rate of inflation. Private institutions realize the government will cover the cost of students going to college through loans so subsequently, they raise fees and push the government to increase their loan caps. 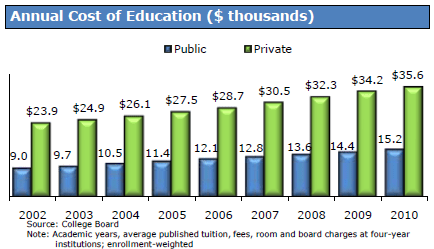 How in the world can education costs be going up at a time when the economy came to a standstill in the last three years? In fact, in the last year we have been dealing with a deflationary environment yet costs of education still keep going up. If schools can increase prices and have the government subsidize loans, then you can rest assured the banks will be pushing these things out like candy. The same too big to fail banks also rear their familiar faces in this market as well. There is nothing better than a student loan for banks. If students default, the bank will be reimbursed by the government. The government can then sell the loan off to a collection agency and go after the student by garnishing wages and other venues that even loan sharks don’t have. Is this double dipping? Absolutely. It is pure economic wizardry when banks are merely serving as middlemen with no risk at the table and are dolling out government backed loans. 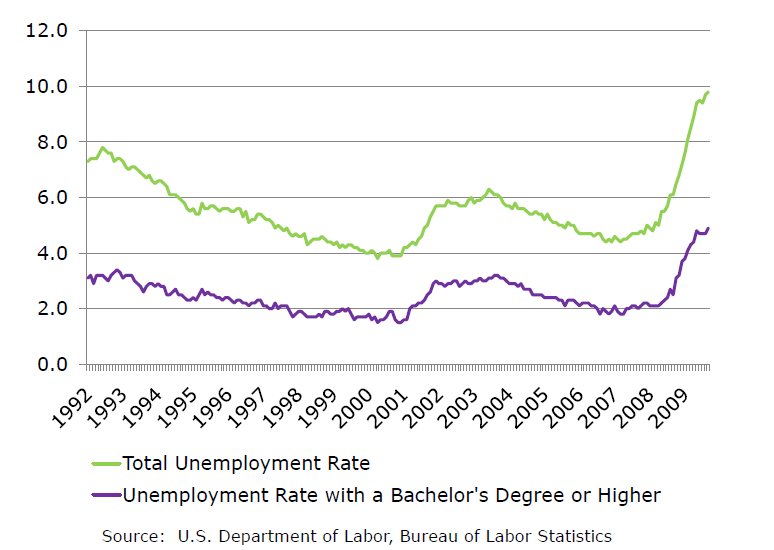 This is the highest unemployment rate for college graduates ever recorded. Think about that. As college education reaches and enters a new price apex each year, the growth of unemployment for college graduates inches higher and higher. Now the mission of education isn’t necessarily to get a job. But when you put such a giant price tag there should be some direct career added benefit. In many cases this is true. Yet in other cases there is a severe self selection bias. That is, most of the ambitious people in this country go to college (not all of course). So trying to justify a high cost for this reason usually hides a lot of the reasons for career success. China is graduating nearly three times the engineers compared to the U.S. They are much larger in proportion as well but so is India yet we graduate (for now) more engineers. Yet this is where we have shifted and outsourced most of our manufacturing base. So we have many questions to examine including what do we want from our education system if the price is so high? One thing is certain however and that is that we cannot continue to have the banking industry and the government so closely intertwined. Every industry in the last two decades that banks have touched have sprouted out bubble tentacles. Technology, real estate, and now the college market. Keep in mind as many more people are unable to pay these loans, the taxpayer is paying the bill yet banks are being paid full face value here. Banks have dumped trillions of dollars of bad housing debt onto the taxpayers and have been pushing student loan debt onto the taxpayer as well for years. 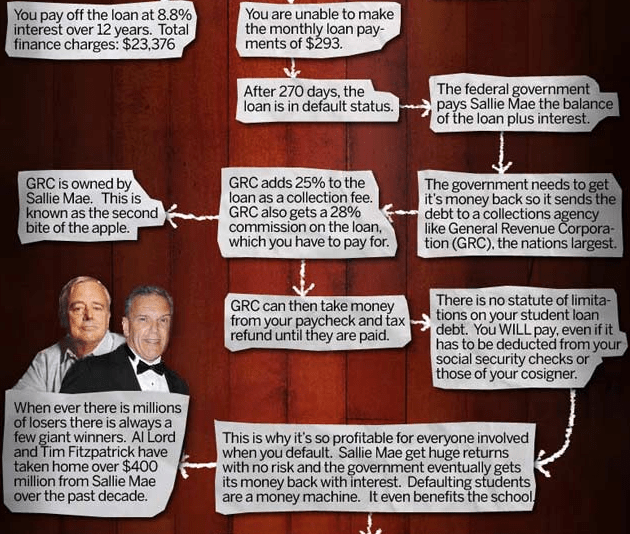 Al Lord and Tim Fitzpatrick, both Sallie Mae big names have pulled in over $400 million over the last decade. Glad that the new mission of education is now paving the way for subsidizing the salaries of big financial lenders.